In this post, we want to show you a list of 20 Excellent Photo Effect Tutorials For Photoshop. Adobe Photoshop comes with a default set of Tutorials that could give you a pretty good idea how things works. Photoshop tutorial by Blue Lightning TV showing how to simulate complex, video glitch effects from a photo and quickly apply them to any other photo. It does indeed feature a major temporal paradox worthy of Dr Who: despite its 1950s feel, nestling at the centre of the photo is an iPhone. It sits snugly in one of a new series of iPhone cases by accessory maker Proporta, designed in collaboration with vintage clothing brand Lalita. When I was a kid, I used to love to pretend that I had super powers. I’d imagine myself flying high over a city that was under my protection from villainy in all its forms! (OK, so sometimes I still do that.) But I found that my kids are no different. In this tutorial I’ll show you how to create a surreal underwater scene featuring a cat sitting in a shoe. You’ll learn how to create an underwater scene using several stock images, as well as how to put an adorable kitty in a shoe and make her first adventure! 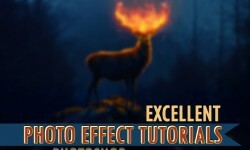 In this Photoshop tutorial we will create a pixel explosion effect. We will create our own custom brush for achieving the explosion effect and add a couple of adjustment layers. In this Photoshop tutorial you will learn how to create a creased vintage printed photograph using adjustment layers, gradients and blending modes to get a retro vintage look. In this photo effects tutorial you will learn how to create a face that looks like it was made from smoke and add some really good colors to it so it looks more professional. This video is pretty basic so beginners will also find it helpful. In this tutorial, Photoshop guru Fabio Sasso demonstrates a straightforward way of transforming a scene from a straightforward daytime shot to a dynamic night-time urban landscape through clever use of blending modes, brushes and plenty of carefully applied Gaussian Blur. If you haven’t seen Taylor Swift’s video for her hit song, Style, then do yourself a favor and check it out! Not surprisingly it’s a “stylistic” video, and it contains some wonderfully inspiring effects using silhouettes and double exposures. Double-exposure photography is becoming increasingly popular and can even be found as a built-in feature in some digital cameras. Creating your own effect in Photoshop is a simple process but it doesn’t always look great. In this Photoshop Tutorial you will learn how to create a smoke dispersion effect using the liquify tool and some nice smoke brushes. Underwater scenes can be quite challenging to create in a realistic way. In this tutorial, we will explain how to create an Underwater scene in Photoshop using several stock photographs. Let’s get started! In this tutorial, we will demonstrate how to add a dramatic rain effect to a photo in Photoshop. While rain effects are not new to Photoshop, we will go a step further and show how to make the image more photorealistic by adding reflections and small puddles. Let’s get started! Recreating colourful, 1980s-style graphics isn’t hard – the tricky bit is updating them for the 21st century. In this tutorial, Karan Singh shows how to add a 1980s twist to stock or specially taken model shots, to jazz up your photos.